A Day Late and A Dollar Short: JCPenney - **FREE** Kids Haircurts on Sundays in November! JCPenney - **FREE** Kids Haircurts on Sundays in November! 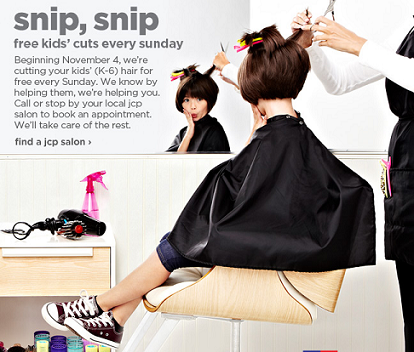 Beginning November 4th, JCP will be giving away **FREE** kids' haircuts again! Children must be between K-6, and you must book an appointment. Visit the JCPenney website to find a location near you.